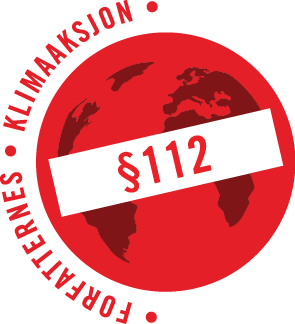 Introducing Norwegian Writer’s Climate Campaign § 112. Norwegian Writer’s Climate Campaign § 112 (NWCC § 112) will actively participate in a much needed democratic process of engaging citizens of all ages to act against the overheating of our planet. Writing is our tool, and with the power of words we will contribute to mounting public awareness and, consequently, the necessary shift in Norwegian energy policy – from fossil to renewable resources. NWCC § 112 was established in May 2013 following an initiative by the General Assembly of the Norwegian Authors’ Union, subsequently supported by the other national writers’ unions. Members of NWCC § 112 represent all literary genres. «Every person has a right to an environment that is conducive to health and to a natural environment whose productivity and diversity are maintained. NWCC § 112 began arranging public events prior to Norway’s General Election 2013. Simultaneously our website was established, from the onset featuring both original and previously published works by fellow writers from many countries, as well as links to scientific sources. Presently, some seventy poems, ‘more than hundred articles, short stories and essays bear witness to Norwegian writers’ expressed concern for the ongoing climate crisis. In 2014, Norway celebrates the Bicentenary of the Norwegian Constitution, and we will use this opportunity to highlight the moral and legal importance of Article 112, and challenge the powers to be, such as Norway’s huge so-called Oil Fund, on their investments in Canadian tar sands and other extremely damaging and dirty fossil resources. Alone or in alliance with a broad spectre of like-minded organisations, we will take action, using our literary, journalistic and artistic craft. IPCC’s Fifth Assessment Report (AR5) 2013 leaves no doubt that the world is heading for a global climate crisis that most severely will harm our predecessors. Our only sensible action now is to turn down the heat and leave Earth’s fossil resources in the ground. The Government Pension Fund Global = accumulated petroleum revenues.